When you first learn how to read, you do not start with Lord Of The Flies. You start with the alphabet. You learn all about the foundational pieces that are used to form words. Then you learn how to put words together into sentences. Then you build paragraphs with multiple sentences of a common thought. You get the idea. Music follows that same line of thought. So, let's dig in to the foundational elements of music with the major scale and the circle of fifths. NOTE: This article is a part of our "Music Theory In Worship" series, and if you haven't read the intro article to the series, we highly recommend that you do! READ IT HERE! Every song, every melody line that gets stuck in your head, every musical hook... they are all built on scales and made using pieces and elements of those scales. Now, there are many different types of scales including: major, minor (relative, harmonic, melodic), blues, augmented, diminished, chromatic, etc. While we will look at some of these in future posts, we are starting at this point with the major scale. This is the foundation as other scales are essentially modifications of the major scale. Interval = the distance between two notes, which can be measured and labeled in either an up or down direction. C to E, for example, is called a major third interval. More on intervals in future posts! 1/2 = Half Step. This is the interval from one note to the very next possible note. This is easily visualized on a piano with the black and white keys. Move up (or down) to the next note/key. For example, from a C, move up to the next black key, which would be C# or Db. That is a half step. There are only two places on a piano where the half step does not involve movement from white to black keys or vice versa. That is E to F and B to C, all white keys, but still only 1/2 steps. MYTH: A whole step is one white key to the next white key on a piano. W = Whole Step. This is simply an interval made up of TWO half-steps. Examples would be C to D, F# to G#, Bb to C, E to F#, etc. So I Know Major Scales... Am I supposed to be excited about that? Now that you know what whole and half steps are, and you know the major scale interval pattern, you can build a major scale starting on any note! This is a set of building blocks that everything else in music is built upon. The better you really know and understand the major scales, all 12 of them, the more prepared you'll be for every other aspect of playing and reading music. As you are playing in worship, you most likely are using chord charts as most church worship teams do. Every chord is constructed from major scales. The structure of a chord is a series of intervals that, when used together, make that particular chord. Knowing your major scales puts you in a position of being able to understand chords to a much higher degree. Then when you really understand chords and their structure, you can play anything. Yes, anything! We mentioned the Circle of Fifths in the previous article, but let's get into what this really is. You've most likely heard about the Circle of Fifths, but maybe have never REALLY known what it is. All of this is built on major scales, so you really need to have an understanding on what was laid out above to fully understand this next part. The "fifths" in this circle are referring to the fifth note of a major scale. Starting on C (the key with no sharps or flats), you then go to the fifth note of the C-major scale, which is G. That is the next key in the circle, and it adds one sharp, F#. Now go to the fifth note of the G-major scale, which is D. This is the next key in the circle, now with two sharps, F# and C#. Continuing to the fifth note of the D scale, which is A, now brings the circle to three sharps, F# C# and G#. Now you see how this works. When you continue this process, you will eventually get back to the key of C. It truly is a circle that you can work in either direction. You can see the corresponding key signatures with each key in the above diagram. Also, note that on the inside of the circle, you can see the "relative minor" keys of each major key. If you missed Part 1 of this series, CLICK HERE to catch up! You can see that this diagram is just crammed with valuable information! How do I get from sharps to flats in the circle? While there are only 12 keys, there are some that show two versions on the circle diagram, as they are enharmonic equivalents. That means, they are the same notes/pitches, just with different names. For example, F# and Gb are the same exact note, just seen in two different ways, depending on what key you are in. So, you'll see in the middle of the circle, some overlap of sharp and flat keys. You get to B-major, which has 5 sharps. The enharmonic equivalent is Cb-major, which has 7 flats. Same key, different names. At this point, flats are introduced into the circle and begin to remove flats as sharps are added. Next is F#-major (6 sharps), which is also Gb-major (6 flats). This is the middle point in the circle. Then you have the last sharp key, C#-major (7 sharps), which is also Db-major (5 flats). As you continue from there, you go to Ab-major (4 flats) and keep removing a flat as you circle around. You eventually get to F-major, with 1 flat (Bb), then the fifth note of that scale is... C! You've returned back to the beginning! So I Finally Understand The Circle Of Fifths. Now What? This can help you with practical aspects of planning your worship set list. Of course, one element that you want to have in your set list is a nice FLOW, right? You want to move from song to song as smoothly as possible, without awkward transitions. By awkward, I mean a musical change that does not remotely sound natural. It jerks at your ear and screams "OUCH"! We'll return to that in a moment. The most natural-sounding transitions, of course, are when you go from song to song while remaining in the same key. But, this is not always possible. So the next best thing is to move to the next song in a closely-related key. What is that? A "closely-related key" key is one that is within two positions on the circle of fifths. Basically, it would be a key that has only one or two more (or less) sharps/flats. For example, the closest keys to A-major (3 sharps) would be E-major (4 sharps) or D-major (2 sharps). A little further, but still under the closely-related designation would be B-major (5 sharps) or G-major (1 sharp). Any of these keys do not add or take away more than two sharps. That makes these four keys your best choice for the next song in your set list. MYTH: I have to sing this song at my church in the same key that the original artist did. WRONG! The artist did the song in that key because that is most likely what best fit their vocal range. You can sing a song in whatever key you want! You determine the key that works best for you, your team and your set list. More to come on this topic! So back to your worship set list... ONE of the ways to determine which key you should do a song in should be based on the rest of your set and the keys that the other songs are in. Also, keep in mind that you do NOT have to do the song in the same key every time! It's actually good for you (and your team) to change it up sometimes and do that familiar song in a different key. Example... say there's a song that I generally do in B-major, but I have it in a set list surrounded by songs in C, Bb and Eb. That song in B-major would stick out like a sore thumb to anyone that isn't completely tone deaf! So I would look at that song and determine if I could take it up to C, or if that would be too high, drop it to Bb. I would try to keep the songs in closely-related keys. How about a BAD example? The worst option would be to transition from, for example, E-major to Bb-major, which is a tritone interval. What is a tritone? It is an augmented 4th or a diminished 5th interval. Same thing, just labeled based on the actual notes involved. A "perfect 4th" would be, for example, C to F. A "perfect 5th" interval would be C to G. Those are very natural and pleasing to the ear. Now, right in the middle is F# or Gb. That interval from C to F#/Gb is the dreaded tritone. This interval is so dissonant that it actually was nicknamed "The Devil's Interval" and was intentionally avoided for centuries by composers. In the realm of sacred/church music, it was forbidden in many cases to use this interval. Does that mean that if you transition in your worship set from E-major to Bb-major (a tritone interval) that the devil will take over from there? Of course not! Obviously, the question is in jest, but that interval and transition will certainly NOT sound natural at all. It will be very dissonant and awkward to most any ear. So, if you can, avoid it. As much as possible, stick with closely related keys when going from song to song. A handy Circle of Fifths diagram, like seen above, can help you with this... at least until you get to the point of knowing it well enough on your own. Remember, we're working towards becoming the most capable, adaptable and effective worship leaders and musicians that we can be! The more of this that you learn, the more this goal will be achieved. Do NOT just read this article and move on! Take this material and study it. Really get it solidified in your head, with a goal of it feeling like common knowledge. 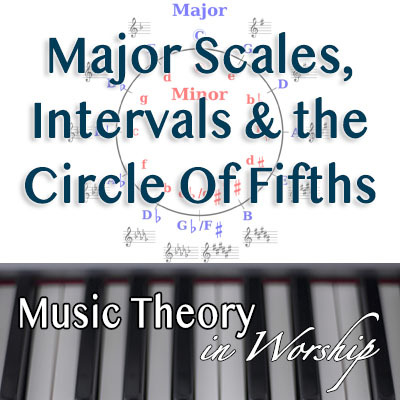 You should know and understand the foundational elements of major scales, intervals and the circle of fifths just as well as you know your ABCs! Be sure to comment below and feel free to ask any questions! Stay tuned for Part 3 of this exciting new article series! And if you missed Part 1 "What Key Is This Song In?" or the Intro "Music Theory In Worship", click the links you just read past to catch up!